Cavernoma, also called cavernous hemangioma or cavernous angioma, is a type of blood vessel malformation, which may be considered as a benign brain lesion.1 Cavernoma can appear at all ages, mainly occurring in the third to fourth decade of life. It is a rare condition, presenting in 0.5% of the general population. In addition, it is estimated symptomatic in 40% of cases. When present, symptoms include headaches, epilepsy due to cerebral hemorrhage and other symptoms depending on the site of the lesion.2–5 Therapeutical options available for patients who have found to have a cavernous malformation are surgery and “stand and wait” approach, depending upon the gravity of each case.6 In this report, we describe a case of a 66-year-old woman, suffering from frontal lobe cavernous angioma of the left hemisphere, which had been diagnosed 20 years earlier. She had presented over the years epileptic seizures and headaches, and 2 years ago starting to present psychiatric symptoms, suffering depression, such as late-onset frontal syndrome. An association of such symptoms in the same patient has not been reported in the literature, being unusual, especially regarding the onset of a psychiatric disorder. A 66-year-old age female, with a frontal lobe cavernous angioma of the cerebral left hemisphere, was clinically monitored for ~20 years at the Department of Neurosurgery at Catanzaro University Hospital, Italy. She had a long history of epilepsy and headache, epilepsy consisting of both partial and generalized seizures, simple partial seizures presenting with motor symptoms and causing jerking movements of the foot, face, arm and complex partial seizures showing confusion and dizziness, with a frequency of 4–5 times per year, treated with antiepileptic drugs (AED) polytherapy, including carbamazepine, phenobarbital, lamotrigine, levetiracetam and all drugs used in different years. Electroencephalograms always showed diffuse slow activity. 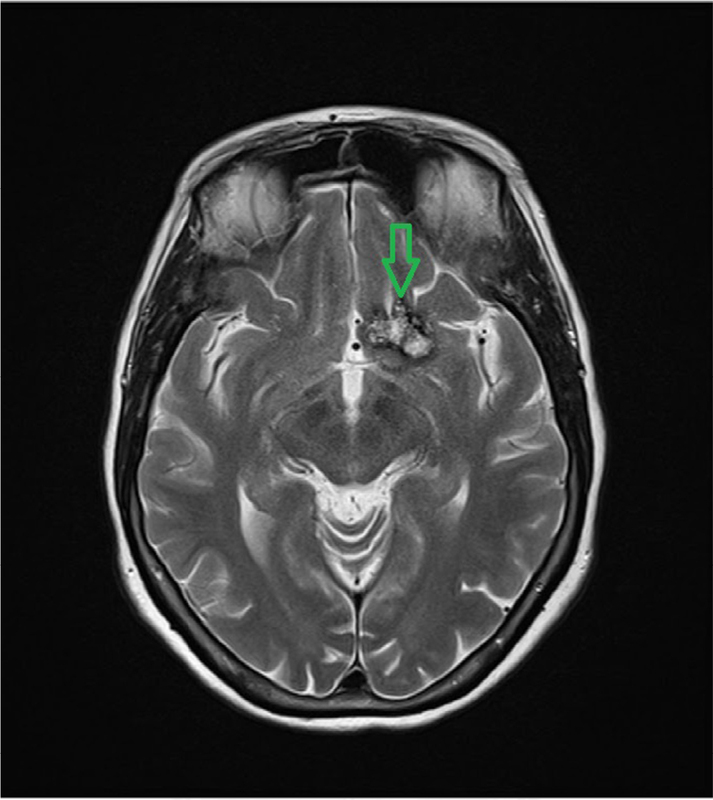 Brain computerized tomography and magnetic resonance imaging (MRI) (Figures 1–3) scan controls did not reveal any increase in the volume of lesion. The headache had migraine features, with and without aura, and pain attack frequency of 1–2 per month. The administration of flunarizine, at a daily dosage of 10 mg was the most effective, with regard to the drugs used, reducing further headache frequency. Approximately 2 years ago, the patient began to present psychiatric symptoms as apathy, indifference, loss of initiative, mood changes, reduction of sexuality, all evoking a state of depression. The following psychological tests were administered: Perception of Housing Quality Scale, Mini Mental State Evaluation, Activities of Daily Living, Patient Health Questionnaire, and Geriatric Depression Scale. All tests showed abnormal scores expressing a depression of moderate to severe type. Paroxetine, an antidepressant of the selective serotonin reuptake inhibitor class, was administered at 20 mg oral daily dose. The improvement of the signs of depression was gradual and in fact the patient is continuing therapy successfully with a maintenance dose of 10 mg oral daily as confirmed by psychological test control results. No adverse effects related to antidepressant were reported. The patient always refused any surgical option. 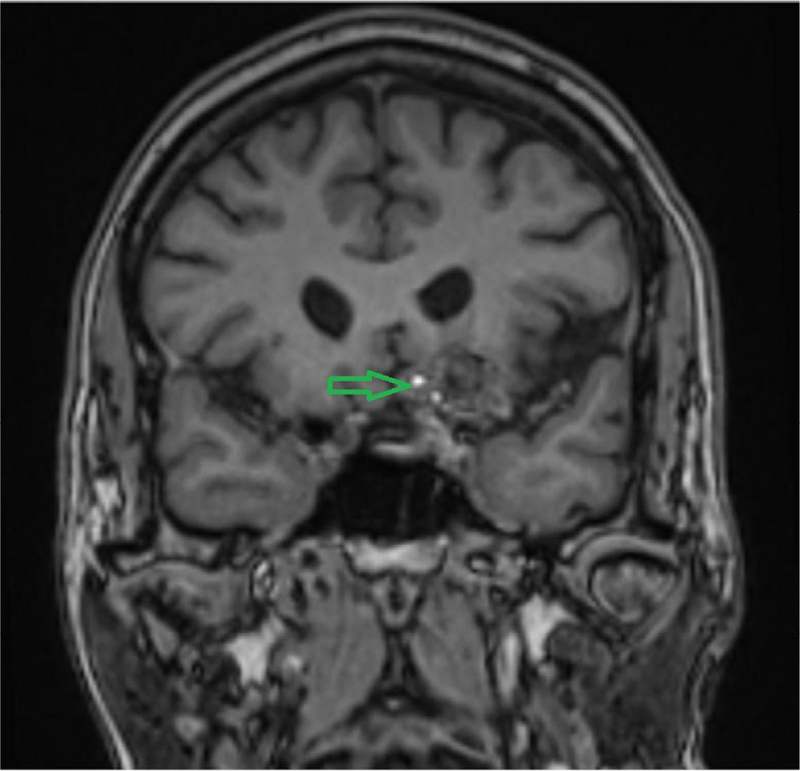 Figure 1 Brain cavernoma axial MRI T2-weighted image shows central high signal and peripheral hypointense rim on 22 mm diameter lesion. Figure 2 Sagittal MRI T2-weighted image. Figure 3 Coronal MRI T2-weighted image. Many cavernous malformations are asymptomatic and can be treated conservatively. Symptoms can relate to mass effect, headaches, epileptic activity or repeated hemorrhage. Symptomatic lesions should, when possible, be resected, and complete resection is curative. The headache is usually nonspecific, taking the pain characteristics localized at the site of the lesion, oppressive, stabbing and sometimes having a chronic course. Headaches are estimated in ~15% of symptomatic cases, with epilepsy in 5%–10% and brain hemorrhage in 1%–2% of cases. Psychiatric symptoms can rarely be found, although it is more easy in the case of voluminous lesions involving the prefrontal cortex. 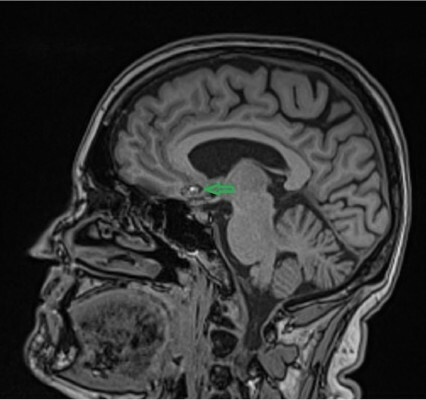 In this case, we report an exceptional association of headache, epilepsy and prefrontal syndrome in a patient affected by frontal lobe cavernoma of the cerebral left hemisphere. The following peculiarities were noted in this case first, the headache is a migraine type as indicated by typical symptoms with good response to flunarizine, a drug used in migraine prophylaxis. This seemed very strange, which makes it difficult to make hypotheses (eg, “traction headache for increased intracranial pressure, followed by activation of trigeminal vascular system”). Then, there is the frontal syndrome: singular was the late onset of psychiatric symptoms. These were represented by a pseudodepression or pseudopsychopathic syndrome. This psychopathological syndrome was described by Karl Kleist (1934), then followed by Blumer and Benson (1975), consisting of change of cognitive functions. Changes are characterized by indifference, apathy, reduced sexuality, akinesia, loss of initiative and crying. These symptoms are related to lesions of the dorsolateral frontal cortex, giving rise to the pseudodepression syndrome, a frontal syndrome with negative signs opposed to that with positive symptoms, the pseudomaniac syndrome, related to damage of fronto-orbital cortex, representing with euphoria, restlessness, sexual disinhibition and childishness.9 Luria (1969) named apathic–akinetic–abulic syndrome a disorder characterized by severe inertia, inactivity reaching a catatonic state, a consequence of bilateral frontal extensive lesions. Several studies demonstrate that the right frontal cortex is also responsible for psychiatric disorders.10 Therefore, the case described, and not reported in the literature, appears unique for the combination of symptoms in the same patient: epileptic seizures, a migraine-like headache and especially the prefrontal syndrome, suggestive and strange for late-onset symptomatology. Cerebral cavernous angioma is usually an asymptomatic, benign vascular lesion. When symptoms appear, they cause headaches, epilepsy and other signs related to the site of lesion. 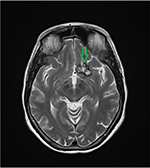 Frontal lobe cavernomas can provoke psychiatric signs, mostly those involving the prefrontal region. While a rare condition is the association of the symptoms listed earlier in a patient, even more rare are migraine-type headaches, and particularly the development of psychiatric syndromes, a late-onset frontal syndrome or yet still a pseudodepression syndrome. The study of this case has induced/motivated/galvanized us to analyze the clinical signs of this unusual association offering the hope/prospect for the explanation of suggestive pathophysiological hypotheses. We thank Dr Michael Ashour for his great help in improving the English language of our manuscript. Batay F, Bademci G, Deda H. Critically located cavernous malformations. Minim Invasive Neurosurg. 2007;50(2):71–76. Gross BA, Du R. Hemorrhage from cerebral cavernous malformations: a systematic pooled analysis. J Neurosurg. 2016:1–9. Buklina SB, Iakovlev SB, Bukharin EIu, et al. [Neuropsychological signs in patients with arteriovenous malformations, cavernomas and hematomas of cerebellum]. Zh Vopr Neirokhir Im N Burdenko. 2009;(4):18–23; discussion 23–24. Russian. Moran NF, Fish DR, Kitchen N, Shorvon S, Kendall BE, Stevens JM. Supratentorial cavernous haemangiomas and epilepsy: a review of the literature and case series. J Neurol Neurosurg Psychiatry. 1999;66(5):561–568. Taylor LP. Mechanism of brain tumor headache. Headache. 2014;54(4):772–775. Fontanella M, Bacigaluppi S. Treatment of cerebral cavernous malformations: where do we stand? J Neurosurg Sci. 2015;59(3):199–200. Dörner L, Buhl R, Hugo HH, Jansen O, Barth H, Mehdorn HM. Unusual locations for cavernous hemangiomas: report of two cases and review of the literature. Acta Neurochir (Wien). 2005;147(10):1091–1096; discussion 1096. Ammor R, Ajja A. [Brain popcorn image]. Pan Afr Med J. 2016;23:3. French. Braun CM, Larocque C, Daigneault S, Montour-Proulx I. Mania, pseudomania, depression, and pseudodepression resulting from focal unilateral cortical lesions. Neuropsychiatry Neuropsychol Behav Neurol. 1999;12(1):35–51. Almeida OP, Burton EJ, Ferrier N, McKeith IG, O’Brien JT. Depression with late onset is associated with right frontal lobe atrophy. Psychol Med. 2003;33(4):675–681.